Kodak has released two new office scanners, the i3200 and i3400, for business processes that require data extraction from paper documents. It said they can produce high resolution images in colour and black and white, simplex or duplex, at 300 dots per inch and at throughput speeds of up to 80 pages per minute. They are equipped with a 250-sheet feeder/elevator, and optimally position documents for maximum image clarity. A graphic user panel displays messages, which can be customised, relating to job name or job status. There is also dual LED illumination to enhance image clarity and colour stability as well as quick scanning starts. Both models include Kodak's Intelligent Document Protection feature, which extends the paper jam protection provided from the Ultrasonic Multi-Feed detection. This helps to protect documents by automatically pausing the paper transport if the scanner detects the start of damage to a document. 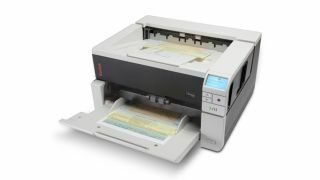 Hauke Fast, product marketing manager for document imaging at Kodak, said: "The i3000 Series Scanners help businesses gain control over manual, paper based processes and integrate them into existing workflows that improve the way professionals capture, share and distribute information within their organisation."